Pepper is one of the most popular spices in most cuisines. It is primarily used for its seasoning properties, but did you know that white pepper/Safed Mirch, which is actually ripe pepper fruit, has several health benefits? White pepper/Safed Mirch finds immense use in traditional Chinese medicine and Ayurveda, where it is used to treat a range of health issues, including arthritis, malaria, nausea and even cholera. White pepper are commonly known as ‘Safed Mirch’ in Hindi, in Telugu they call it ‘Tella Miriyalu’, in Tamil it is known as ‘Vellai Milaku’, in Malayalam they call it ‘Vella Kurumulagu’, in Kannada it is known as ‘Bili Menasu’, in Gujarati it is called as ‘Safed Mari’, in Marathi they know it as ‘Paandri Miri’, and is known as ‘Shah Morich’ in Bengali. You too can benefit from this condiment’s medicinal properties. So, here are some amazing benefits of white pepper for health, skin and hair that you should be aware of. Capsaicin is one of the main compounds present in white pepper. This compound gives the pepper its characteristic heat. However, capsaicin is also known to alleviate pain and has anti-inflammatory properties. It can ease muscle inflammation, and joint inflammation brought on by arthritis and sprains. White pepper is also used in many pain relieving gels and sprays due to its property to alleviate pain. When you consume white pepper, the heat in it causes you to sweat. Ancient Ayurveda practitioners believe that when there is excessive fluid in the body, it can build up around the heart, exerting pressure on the heart. As a result, the heart cannot function properly. However, the sweating due to white pepper consumption flushes out excessive water from the body, allowing your heart to function optimally. If you are suffering from a headache, consume white pepper. Headaches occur when neuropeptides transmit pain to the brain. The capsaicin in the pepper hinders the functioning of the neuropeptides, and relieves the pain. If you have a sore throat, you can mix white pepper with some honey and consume it. The antiseptic properties and the ability to generate heat ease the sore throat and cough. This will reduce coughing bouts due to an upper respiratory infection. White Pepper/Safed Mirch can get rid of nasal congestion, allowing you to breathe without difficulty. The capsaicin helps to clean out mucus from the nasal passages and air ducts, providing instant relief. White Pepper/Safed Mirch is replete with vitamins A and C and flavonoids. These compounds work together to reduce high blood pressure as they are potent antioxidants. If you have a toothache and cannot visit the dentist, you can ease the ache by mixing white pepper with a little bit of clove oil and applying on the affected tooth. This will provide relief till you consult a dentist. White Pepper/Safed Mirch has carminative properties and hence, it prevents gas formation in the intestine. The pepper boosts the secretion of hydrochloric acid in the stomach and this facilitates quick digestion. So the food does not have an opportunity to ferment in the stomach and produce gas. White Pepper/Safed Mirch contains a chemical compound known as piperine. Research has found that it improves cognitive working of the brain and is extremely effective in alleviating depression. Hence, researchers opine people who consume white pepper are less prone to depression. 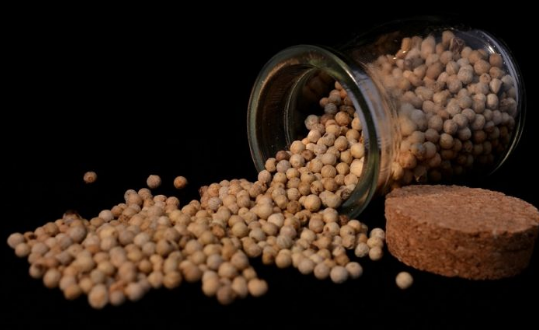 Researchers from Seoul, South Korea, have found that piperine in white pepper is quite effective in blocking fat. The compound prevents new fat cells from forming in the body and thereby, helps people to lose weight.